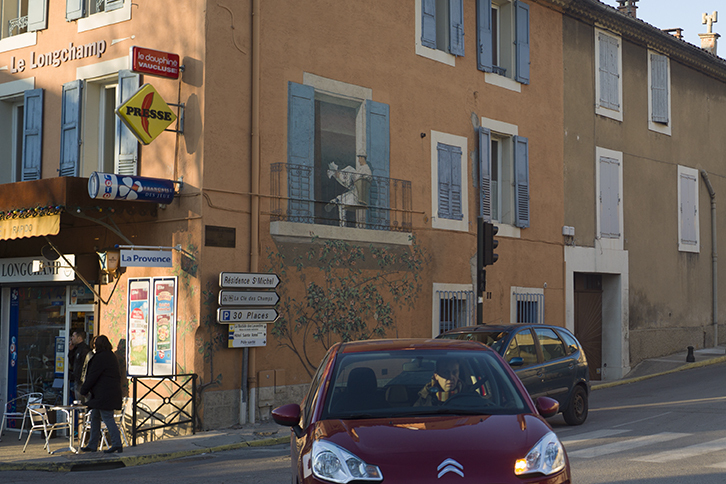 After leaving the market in Apt and heading home I passed this corner where for a brief second the trompe l’oeil of the man in the window made me me jump as if he were really there. Probably the traffic, the turn I made, my mind dealing with the rest of the list of things to accomplish, allowed for the suggestion to express itself as fact for the briefest of seconds until my mind rendered the reality for what it was. I guess that’s the reason trope l’oeil means fool the eye, because it really does. And it also fools the mind, not just the eye. But for only a moment. Perhaps photography does that too, in the way it asserts that what we are looking at is real when it is only a thin sliver of what the moment, reduced to 2 dimensions, and the play of light and space, looks like. Then we deal with the ambiguity and its relation to reality, and decide what it all adds up to. The gift of this medium is to challenge us this way. John Szarkowski once wrote, “a photograph is what it looks like”. This entry was posted in Uncategorized on January 17, 2015 by joelmeyerowitz2014.